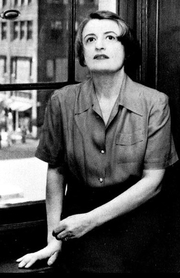 Ayn Rand was born in St. Petersburg, Russia, on February 2, 1905. . In order to escape the fighting in the Russian Revolution, her family went to the Crimea, where she finished high school. When her family returned from the Crimea, she entered the University of Petrograd to study philosophy and history, graduating in 1924, when she entered the State Institute for Cinema Arts in 1924 to study screenwriting. It was at this time that she was first published: a booklet on actress Pola Negri (1925) and a booklet titled “Hollywood: American Movie City” (1926). In late 1925 she obtained permission to leave Soviet Russia for a visit to relatives in the United States. Ayn Rand died on March 6, 1982, in her New York City apartment. Ayn Rand has a Legacy Library. Legacy libraries are the personal libraries of famous readers, entered by LibraryThing members from the Legacy Libraries group. » Ayn Rand's legacy profile. Ayn Rand is currently considered a "single author." If one or more works are by a distinct, homonymous authors, go ahead and split the author. Ayn Rand is composed of 26 names. You can examine and separate out names.